I am lucky to have known two scholars who have devoted their lives to cultivating and teaching geometry. They are Daniel Pedoe in England and the United States, and Fukagawa Hidetoshi in Japan. Each of them had to swim against the tide of fashion. For the last fifty years, both in art and mathematics, the fashionable style has been abstract: famous artists such as Jackson Pollock produce abstract patterns of paint on canvas; famous mathematicians such as Kurt Gödel construct abstract patterns of ideas detached from anything we can feel or touch. Geometry is like representational painting, concerned with concrete objects that have unique properties and exist in the real world. Fashionable artists despise representational painting, and fashionable mathematicians despise geometry. Representational painting and geometry are left for amateurs and eccentric enthusiasts to pursue. Pedoe and Fukagawa are two of the eccentric enthusiasts. Both of them fell in love with sangaku. Between the seventeenth and nineteenth centuries Japan was totally isolated from the West by imperial decree. During that time, a unique brand of homegrown mathematics flourished, one that was completely uninfluenced by developments in Western mathematics. People from all walks of life--samurai, farmers, and merchants--inscribed a wide variety of geometry problems on wooden tablets called sangaku and hung them in Buddhist temples and Shinto shrines throughout Japan. Sacred Mathematics is the first book published in the West to fully examine this tantalizing--and incredibly beautiful--mathematical tradition. 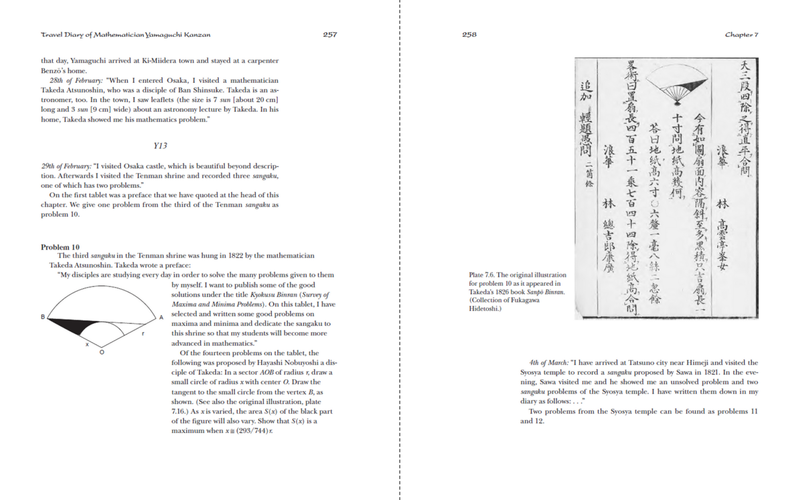 Fukagawa Hidetoshi and Tony Rothman present for the first time in English excerpts from the travel diary of a nineteenth-century Japanese mathematician, Yamaguchi Kanzan, who journeyed on foot throughout Japan to collect temple geometry problems. The authors set this fascinating travel narrative--and almost everything else that is known about temple geometry--within the broader cultural and historical context of the period. They explain the sacred and devotional aspects of sangaku, and reveal how Japanese folk mathematicians discovered many well-known theorems independently of mathematicians in the West--and in some cases much earlier. The book is generously illustrated with photographs of the tablets and stunning artwork of the period. Then there are the geometry problems themselves, nearly two hundred of them, fully illustrated and ranging from the utterly simple to the virtually impossible. Solutions for most are provided. Website HERE, below a typical two-page spread.